KANSAS CITY, Kan. — It’s a classic story. A kid grows up in the church and a loving family, goes to the big state college and loses his or her faith. Except when that big state college is the University of Kansas, where students’ faith is fed by the St. Lawrence Catholic Campus Center. 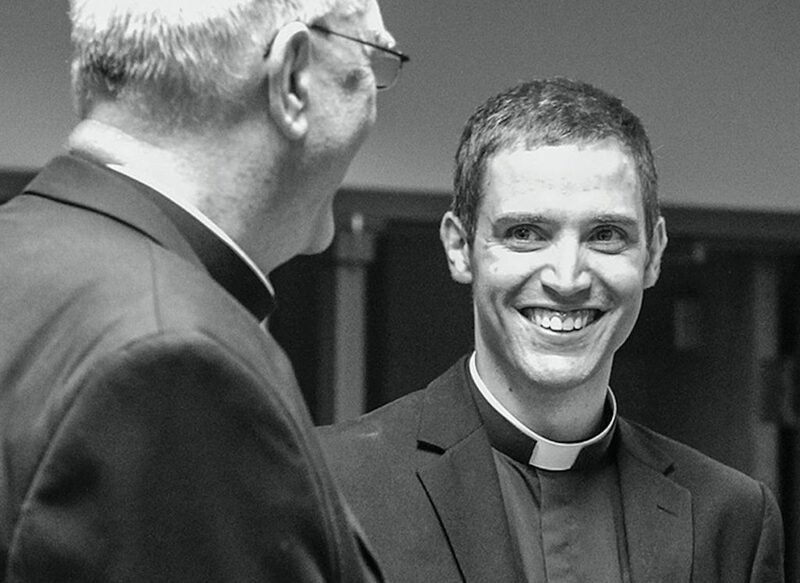 Rather than leading Deacon Joel Andrew Haug away from his childhood faith, his college experience intensified his faith and led him to explore a vocation to the priesthood. Deacon Haug was born and raised in Atchison, a cradle Catholic from cradle Catholic parents. He is the youngest of the five children of James and Aleda Haug. His father is a retired ophthalmologist and his mother was a nurse before becoming a stay-at-home mom. His was a conventional Catholic family life. “Sunday Mass was a regular event,” he said, “and praying before dinnertime. It was the way we incardinated [our faith] in daily family living — just good family values. We enjoyed spending time together. . . . We got along very well. The children attended Catholic schools. Deacon Haug went to the then-Atchison Catholic Elementary School (now St. Benedict School) and graduated from Maur Hill-Mount Academy in 2008. Not once did the thought of the priesthood cross his mind. He didn’t even serve Mass while growing up. “I actually didn’t like being in front of people, so I didn’t serve,” he said. He thought for a while that he might follow his ophthalmologist father and neurologist brother into medicine. So, he went to the University of Kansas to study Spanish and pre-med. But while he was there, he found a special place: the St. Lawrence Catholic Campus Center. At the Catholic center, he met two people who would come to have a big influence on him: the center director and chaplain Father Steven Beseau and Sister Elena Morcelli, AVI (Apostles of the Interior Life). They helped him lay a good foundation for a daily prayer life, which he had not had up to that point. Then, two important turning points — his participation in the March for Life in Washington, D.C., in January 2009 and a Koinonia retreat at the campus center — invited him in further. The center had a loving and joyful community, he said, which was very attractive. He began to make friends with other Catholic students, and Sister Elena became his spiritual adviser. A closer relationship with Jesus followed, through a daily prayer life, eucharistic adoration, daily Mass and frequent confession. He began inviting other people to the Catholic center. Discernment is usually considered a gradual process and part of a deepening relationship with Christ, said Deacon Haug. But on a discernment retreat with the AVIs in May 2010, he felt a definite call from the Lord to the priesthood. Furthermore, he clearly felt called to live in community with others who felt a similar call. The Apostles of the Interior Life is a public association of the faithful, formed in 1990 and approved by the Archdiocese of Kansas City in Kansas and the Diocese of Rome. It has both male and female branches. Their main focus is to provide spiritual formation. Ten days after Deacon Haug graduated from KU in 2012, he was on an airplane to Rome for studies at the Pontifical Lateran University and the AVI community. The community moved to the Archdiocese of Kansas City in Kansas in 2014, and he entered Kenrick-Glennon Seminary, St. Louis, in 2015. He was ordained a deacon on by Archbishop Joseph F. Naumann on May 19, 2018, at Holy Trinity Parish in Lenexa. He will be ordained a priest by Archbishop Naumann on May 25 at Church of the Ascension in Overland Park. Deacon Haug is grateful for all the faithful people who’ve helped him on his journey of discernment. And this is his advice to those who think they may be called to the priesthood.